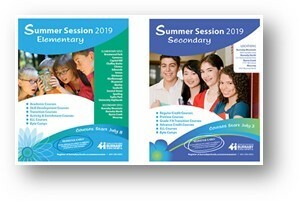 At Ecole Inman Elementary School, we provide opportunities for students to achieve social and individual excellence in a safe, positive and respectful learning environment. 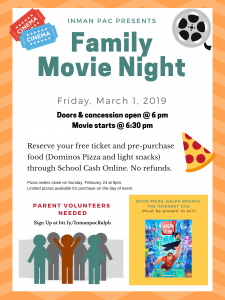 Please join us for a night filled with fun and laughter at our PAC Family Movie Night. Introducing Ralph Breaks the Internet. Our loveable wrecking video game pal is back in a whole new movie. Only this time he takes over the internet. Join us in great family fun as we watch Ralph and Vanellope tour around all our favourite apps and websites. Please order a ticket from School Cash Online by February 27th so we know how many are coming. You can also add Pizza, Chips, Juice, and Candy to maximize the movie experience. Pizza orders need to be in by February 24th and can be done on School Cash Online. Chip, Juice, and Candy orders need to be in by February 27th and can also be done on School Cash Online. A concession will be open on movie day selling snacks and a limited supply of pizza sold for cash as well. Parent volunteers are also requested and can sign up here to help with set up and clean up. Thank you! 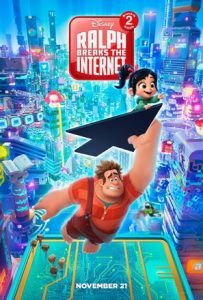 We hope to see you there to enjoy Ralph Breaks the Internet! Teriyaki Bowls for Hot Lunch!